Grab a bargain or two at the ‘Clearance table’ at Sensory Lab at David Jones, before they all go. Great coffee equipment products starting from as low as $3 bucks for espresso cups and saucers (in black, beige and orange) to $150 for an electric conical burr grinder by Delonghi, normally priced at $190! Bialleti Stove tops are also heavilly reduced. Mini Mazzers (Stainless Steel version) reduced to $650 (normally $850) – 3 left. You can’t get better than that! Grindstein knock boxes reduced to $24 (normally $45). Sensory Lab at David Jones has come up with an amazing idea. Have your freshly roasted specialty coffee by Sensory Lab delivered directly to you, every week, fortnight or month! You can select from their exclusive S-1, S-2, S-3 blends or receive the Roaster’s Choice ‘Single Origin’ blend. Their master roasters will examine a single origin coffee in peak season and roast it fresh on rotation every second Thursday of the month. This offering is exclusive to coffee subscribers only. You’ll get to enjoy our exclusive Sensory Lab coffee blends, juicy single origins and previews of new coffees before they are available to the public. Each coffee you subscribe to will come with an online certificate with information about the journey of this particular coffee. Join the Sensory Lab Coffee subscription club and enjoy freshly roasted specialty coffee every day. This year has been monumental. We hosted Geoff Watts from Intelligentsia in Chicago (and LA) and Meiko the Siphon champion from Tokyo, we made loads of new friends and reacquainted with some old ones. Tim Varney and Tim Wendelboe in Oslo, the boys from Giesen in The Netherlands, the guys from Schuilenburg in Brussels, Mr Schmidt from Probat, Flori form Mercanta Coffee Hunters in London, Anita Le Roy from Monmouth Coffee in London, James Hoffmann from Square Mile in London, to mention just a few. We also had the pleasure of drinking coffee from the most silent of machines by Gwilym Davies the current WBC champion and all round nice guy. Our team went on loads of field trips in search of the best coffee and thirst for knowledge to continue our strive for excellence. Eric Perkunder had faith that we would take care of his beloved Slayer. He was a very generous host to Matt, who still hasn’t stopped talking about the wrestling. Ryohei-San and the guys from Hario, their beautiful products are being enjoyed by many. Mr Horiguchi gave us access to some rare micro-lot coffees through his coffee buying group, Coffee Lovers Family. We helped many such as The Brood Box, the Final Step and Globe cafe enter the world of specialty coffee, we opened Outpost, which Matt Preston loved, Sensory Lab at David Jones, which is “bringing good coffee to the masses”, and featured guest coffees from Square Mile, Tim Wendelboe, Monmouth, Seven Seeds and others. We also had our coffee guest featured overseas including Fernandez and Wells in London. We worked with Street Smart to help street kids, we did some nice things (including sponsoring the Golden Bean Awards and spending some face time with Andrew Ford at his Mountain Top plantation in Nimibin). We also need to especially thank Ben Cooper and Toshi Ishiwata who both demonstrated a relentless commitment to coffee and food pairing and in so doing have championed this space in Australia and possible the world. Ben would also like to thank Bob Hart for his continuing support and belief in his food. Thanks also to Paul Wilson who was a guest chef at one of the country of origin dinners. 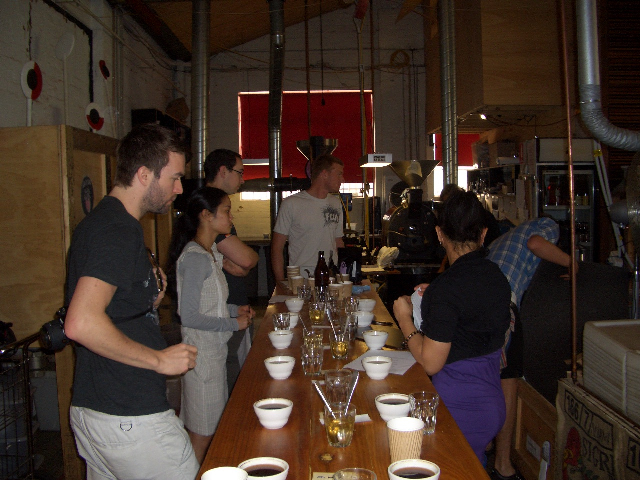 … and 2010 is so exciting with the opening of our green bean warehouse and new roastery. And finally, we are open right through because we want to keep the love going except for Christmas day (because our mums want to see us) and New Years day (because we will be obliterated).